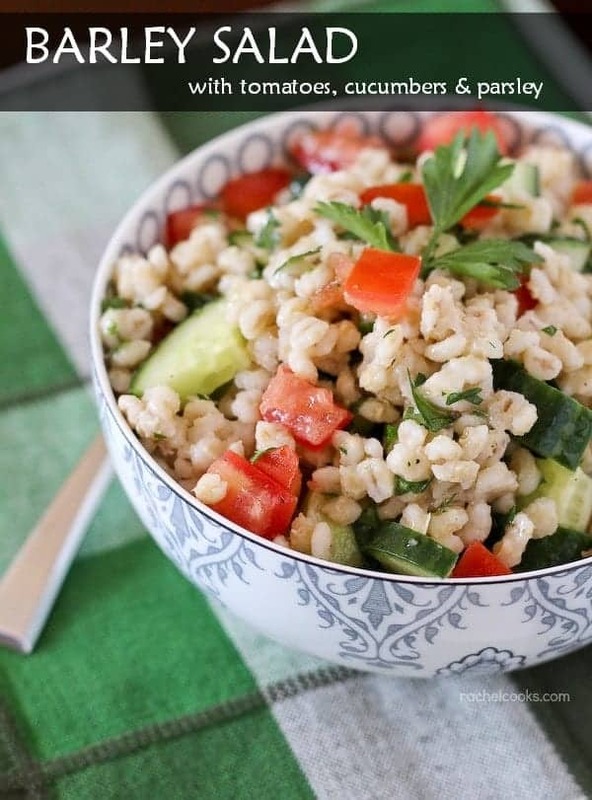 This Barley Salad with cucumbers, tomatoes and parsley is a a refreshing, healthy, and filling summer salad. It works great as a side dish or as a complete meal. Kids are whining and I’m just looking for something to eat as quickly as I can after I prep their lunches. I’m throwing lunch together at 8AM and packing it in a cooler because we’ll be out and about around lunch (usually play dates). I’m completely exhausted and I want to eat my arm. But I have two toddlers so my arms are a bit of a necessity. I think I’ll keep them. Oh wait, that’s five. I swear, kids go from happy and cheerful to grumpy and whining in about .00003 seconds — right after I mention the “L” word — lunch. I mean…can they just give me two seconds to make it? I try to get them to understand that I’d be able to make it a lot faster if they weren’t hanging on my leg and standing right in front of the refrigerator. Same applies for dinner, kiddos. Breakfast too, for that matter! Getting back to the point, this salad is the perfect thing to grab out of the fridge once the kids are securely in their seats eating their lunch quietly and happily. At least happily. Quiet? Ha. 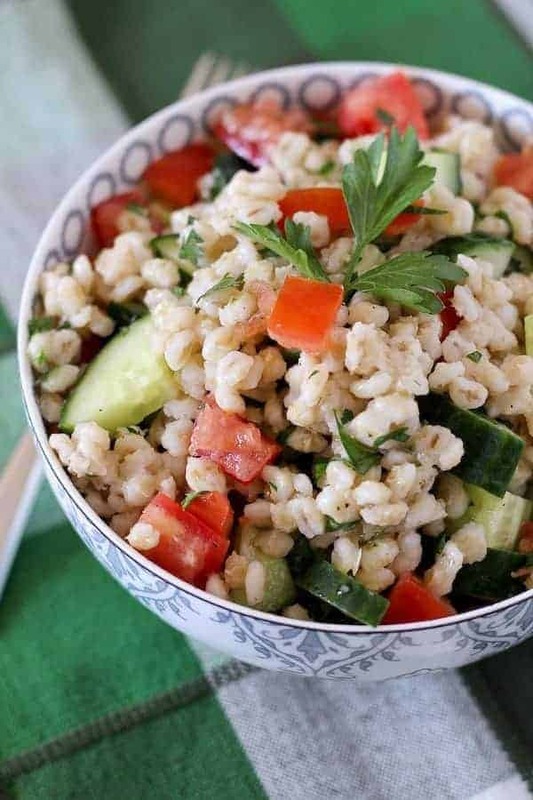 This salad is filling and healthy thanks to fiber-full barley. Barley also has about 4 grams of protein (at least that is what my internet research is telling me). 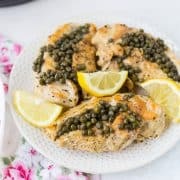 If you were to have this be a main dish for lunch or dinner, you might want to consider adding some garbanzo beans or some feta cheese for a little extra boost of protein. They would both be perfect fits in this salad. 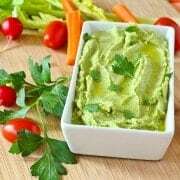 It has a great fresh Mediterranean flavor with a light and simple dressing made from lemon juice and olive oil. PS: This brand of barley is always a good bet. 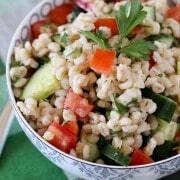 PPS: This barley salad is vegan if you make it as written! If necessary, use a fork to fluff up barley and separate pieces. 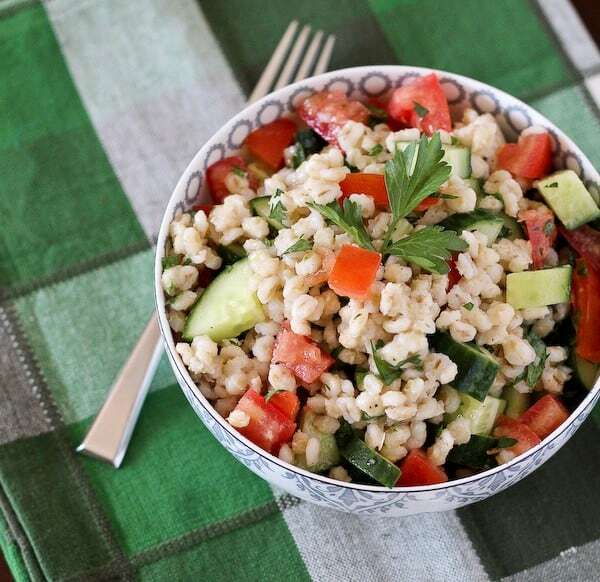 Add tomatoes, cucumbers, and parsley to barley. In a small bowl or measuring cup, whisk together lemon juice, olive oil, and salt and pepper. Pour the dressing over the salad and stir to combine and coat everything in the dressing. Serve immediately if desired, or keep in fridge overnight prior to serving. Feel free to add more lemon juice and olive oil if needed if the barley soaks up some of the dressing. Eating this as we speak! I didn’t have Za’atar, but I did end up having to add some more spices in its place in order to avoid a “blah” flavor to it. I used dried thyme, oregano, cumin, and coriander (aka the closest I could get to za’atar with what I had in my cabnet) and it lifted it to a whole new level. Thank you so much!! That sounds like a perfect mix of spices! I’m glad you liked it! Delicious! I’m making this again soon. I added some fresh chives as they grow in abundance behind our house! Haha this made me totally laugh out loud in agreement! 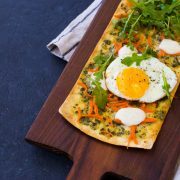 Definitely starving by the time lunch hits so love that you can make this ahead of time! It looks like the perfect healthy summer salad! I love full meal salads. I’m with ya, this is great to have in the fridge ready to go. What a great lunch recipe! This would make a great pack lunch too. Rachel! This salad looks so refreshing and hearty! I can see why this is something you’d like to have ready and waiting in the fridge! Thanks for the recipe and beautiful photos (heading to Eat Your Heart out now)! This looks like the perfect grab-and-go kind of lunch that I love. What a perfect healthy summer salad! I’ll definitely be making this one multiple times! Tell me ABOUT IT!!! Oh wait, you did tell me about it… many times. ;-) Dangit, you were right. I don’t have kids, but I love having big bowls of grain salads like this in the fridge to munch on when the urge strikes! Looks awesome! heck yes! Great for anyone that is busy! And I know you are!